The first round of the 2018/19 Flahavans Primary Schools Cross Country League took place on Wednesday 10th October at the University of Ulster in Coleraine. To help promote running, Springwell RC assisted Athletics NI by arranging the venue, building the course and arranging the marshals to coordinate the 235 primary schools pupils who enthusiastically took part. The weather was perfect, with a calm, dry sunny morning under a very blue sky and the races started promptly at 10.30am with a 600m mixed fun run for the younger pupils before the 1200m boy’s and girl’s races. In the girls race it was Springwell RC junior member Eobha McAllister from St Joseph’s PS, Dunloy who continued her form from last year’s league who won in 4.42. Tanya Jide-Ojo from Millburn PS was second in 4.52 followed closely by Leona Martin from St Brigid’s PS, Mayogall who finished in 4.54. St Joseph’s PS, Dunloy won the team event. In the boys race Henry Curley from St Brigid’s PS, Mayogall won in 4.37 with Reef Ferris, Ballykelly PS second in 4.40. Dara O’Kane, St Brigid’s, Mayogall was third with a time of 4.45. St Brigid’s PS, Mayogall were convincing winners of the team event with two of their runners in the top three. Round 2 of the Flahavans Primary Schools Cross Country League will take place on the 5th December in Limavady. The NIMAA Cross Country Championships took place on Saturday 13th October at a very wet QUB sports grounds on the Upper Malone Road, Belfast. These championships also incorporate the selection trials for the international team to take part in the forthcoming British & Irish Cross Country International XC. 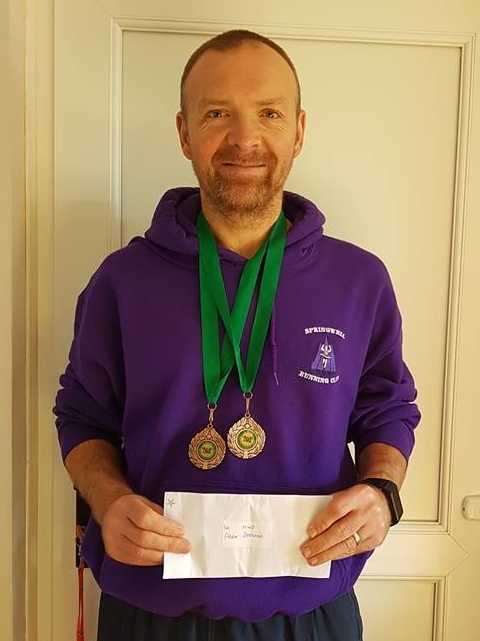 Springwell RC had a number of members taking part in the event and Gerry O’Doherty placed second in his age category and qualified for the M60 team. Bryan Edgar qualified for the M55 team and Alex Brennan has been selected as a reserve for the M45 team. At the evenings awards presentation for the 2017/2018 season Alex Brennan won bronze medals in the 5k and cross country championships and won the 2017/2018 league series. The Royal Parks Half Marathon on 14th October in London saw Springwell RC members Gary Kendall and Kay Hack running to raise much needed funds for Cancer Research UK. Gary finished in 848th place with a time of 1.35.33 while Kay was 9370th in 2.10.03. Sunday 14th October saw Springwell RC members taking part in Half Marathons in Manchester, Lisbon, Portugal and Palma, Majorca. In Manchester Dave Sexton ran a 1.29.59 to finish 557th (5th M55), while in the warmer climate of Lisbon, Rebecca Donaghey was 1784th with a time of 1.56.19 and, in the warmest venue of the weekend Rebecca Clarke ran 2.57.35 to finish 3953rd in the Palma Half Marathon.